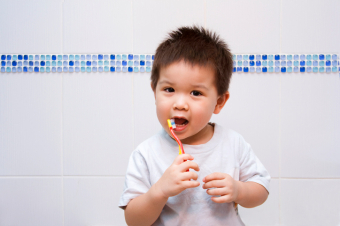 Brushing and flossing will feel like a normal part of your child’s daily life if you start the habit early. The earlier, the better! You can even begin cleaning your child’s gums gently with a damp cloth even before any of the teeth have erupted. As the teeth begin to erupt, you can brush them with a baby-friendly toothbrush, and start flossing as soon as there are two teeth next to each other. These early routines will ensure that your child will have no memory of NOT brushing and flossing regularly, making these habits feel like an inherent part of daily life. When your child is old enough to do so, let her select her own toothbrush, dental floss and toothpaste. This will give her a sense of personal agency in the process, and make her feel more inspired to brush and floss using the tools she picked out herself. Put aside a couple of minutes twice a day, at a specific time, and devote them exclusively to the family oral hygiene routine. This will show your child that oral hygiene is a priority that is worth a special position in daily life. Use a chart or calendar to track oral hygiene goals. Every full week (or two weeks, or month) of twice daily brushing and flossing completed earns a small reward. The reward can be almost anything, from a sticker, or an extra half hour of play time before bed, to a slumber party with friends or a trip to the movies. This provides your child with something tangible to work toward, and creates an incentive for maintaining healthy habits long term (if simply having healthy teeth and gums isn’t quite enough!). You've probably noticed that kids tend to watch and mimic mom and dad. 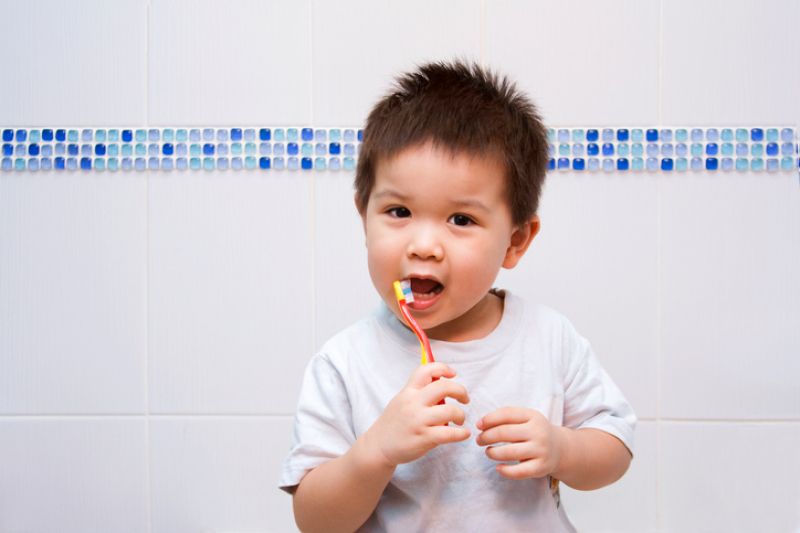 Let your kids see that your oral hygiene routines are important to you, and that you are committed to maintaining them. They’ll more than likely follow suit! Enlist the help of your older kids in setting a good example. Ask them to show the younger kids that brushing and flossing are important to them, and to help them along. Little kids almost invariably want to be like the big kids, so this can be a big help! It may also have the added benefits of renewing your older kids' interest in their oral hygiene routines! Be sure to praise your child when he does a good job brushing his teeth. Saying things like, “wow, your chompers are just sparkling today!” or “my goodness, your breath smells so fresh!” or simply commenting on how proud you are that he’s doing such a wonderful job taking care of his smile, will provide much needed encouragement. Developing healthy hygiene habits in childhood will make it more likely that good dental health will follow your child into adulthood. Contact our Burnaby children's dentists today for more tips and advice!